★★★★☆ Google has created a nice device that provides music and information by voice control. The microphone is very good and will usually pick up commands from across the room. The speakers sound surprisingly good for such a small device. I wish it had tone control though. It will stream Pandora, YouTube music, Spotify and Google Play Music. You do need to have a paid subscription to play specific songs on request. I subscribed to the YouTube Music app and it is pretty good. The only downside is I have most of my personal music collection on iTunes and it will not stream. Other than that it's a cool device. ★★★☆☆ NOTE: This is a product review. The seller is A+++ seller. 4/20/18 (Friday). It failed to wake me up for my critical trading day. I missed my sale of stock opportunity that cost me thousands. I never thought just basic features would fail to work. Google knew about the bugs. It is a good product except for the software reliability. Now I have to use my phone alarm in addition to Google Home (defeated the reason to use it as alarm or tasks reminding). For speaker, it has good sound and convienent to ask simple questions. I would give it a five stars if the software is fixed to ensure no critical features are failing. I give 5 stars for hardware 4.5 stars for AI ability to recognized questions. 1 stars for software QA since they missed basic features. OVER ALL 3 STARS. ★★★★★ Hopefully it will continue to evolve, but happy with the device. Plus I have Google Cast speakers which this helps me control and send music of my choice to my speakers. Love standard features, such as interfacing with google search, google music, etc. Plus, great alarm clock and keeps my calendar at my convenience. ★★★★☆ Very easy to setup using Android app - although I had to change my phone's language from English(UK) to English(US). I had trouble getting good UK- US plug adapter, because supplied power adaptor has built-in plug and is quite heavy, so it tends to fall out of plug adapters that don't grip tightly! Also, you can not use your favourite 5V USB power supply, as the supply is 16.5V, 2A with an angled jack plug that fits in the bottom of the Home device. This plug adapter worked well for ebay dot co dot uk/itm/30112866514 Easy to link to my chromecast tv, but I have not yet managed to connect it to my chromecast audio, rather when I try to connect it, the chromecast audio, it says 'voice control not supported'. Google Home only plays google music tracks my name and/or artist if you subscribe to google music. If you only have the free google music service, it will only play playlists that you have created. This is bad, as the Echo Dot can play tracks by name from Prime music. I also bought Echo Dot (as most of my music is on Amazon Prime). 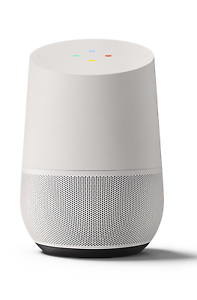 Google Home is better at contextual questions, but the Echo Dot is not bad either. ★★★★★ This is smart enough to know human nature language. Also it is perfect companion with Chromecast, it voice command TV on/off and volume, as well as what to stream from YouTube on TV, also you can choose specific songs from Spotify using free account, it makes chromecast more useful, and chromecast makes it more useful.